The ceremonies at the Royal Festival Hall at the Southbank Centre - just a stone's throw from the University's Southwark campus - will be spread throughout October, and mark the first graduations since the University moved from four faculties to a seven school structure in 2014. LSBU Vice-Chancellor Professor David Phoenix said: “As the first to graduate from our new schools - a model which has enabled us to focus on academic groupings that more closely align to our identity as an enterprising civic university that is having a real impact on business, the professions and society - these individuals have a significant place in the history of LSBU. 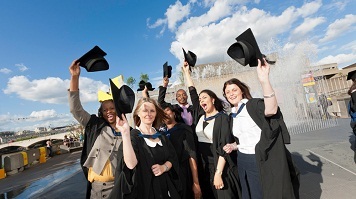 Find out more about graduation at LSBU.